As you'll have seen in one of my previous blogs, I wrote a letter to my local SNP councillor Anne McNair, who voted against the Bears Way extension. Unfortunately, despite me chasing via e-mail and on Twitter (local SNP group Twitter). I never did receive a reply. So yesterday, seeing that Anne had a surgery 10 minutes walk from my house, I went along for a chat. My 11 year old son came along, mainly as he wanted to hear why the lane wasn't being extended. Here is a summary of what happened. I should add, that twice during the meeting I stressed that if Anne wanted to say anything off record, that I'd be happy to keep those comments confidential. She didn't take me up on that. First off, let me state quite clearly, Anne was very nice, was very willing to listen and whilst she did dodge a few questions a wee bit, she was generally quite candid. She gave me about 50 minutes of her time. I thank her for that. I was though, pretty dismayed by the end of the meeting. First off I explained who I was and the fact that I had tried to contact her on a few occasions without any reply. Anne explained that Cllr Ian MacKay had put together a that was supposed to have been sent to everybody. I certainly hadn't received that, and Anne was surprised. No matter if this was true or not, my letter did not ask generic questions. I wanted to know why Anne had voted against it, not everyone else. The first interesting fact that I heard, regarded some comments from Jim Gibbons. After the vote he had e-mailed people suggesting that there would be congestion at Boclair (despite modelling suggesting otherwise), if the lane went in. Interestingly the SNP group apparently 'gave him a row' over that e-mail. The next interesting thing was that she didn't realise that Keith Small was suggesting that segregated cycle lanes in general were not the way forward. Anne seemed to think he was only talking about the A81. From his comments, and a meeting a friend of mine has had with him recently confirms he is opposed to them completely. Anne looked a little uncomfortable at this. It was then decided to ask a difficult question. Were you pressured to vote as a political group on this? I then pointed out that Cllr Cummings (Ind) just before the vote, stood up and confirmed that this would be a free vote. Everyone murmered in agreement and someone, not sure who, said that this was always the case. Obviously it wasn't. Anne, did not remember Cllr Cummings comment. Anne then pulled out her mobile phone, whilst I was talking. She was showing me a picture of one of the chicanes in the lane at one of the bus stops. At this moment, I knew where she was going. But a lot of cyclists don't use it! I must admit this surprised me. I'd heard this line being used before, but I didn't expect it from Anne. I pointed out that surveys have shown that 92% of cyclists do use it. Actually, a very large number considering the fact that Anne thinks the design is terrible. She repeated the cyclists don't use it line, and I repeated the 92%. We talked about off road, and I pointed out that cyclists are people and want to go where people want to go. That is down the main routes. They are main routes for a reason! I also asked how people would get to the off road routes.. Anne didn't answer. At this point someone popped their head in to the room and Anne had to pop out for 5 minutes, At that point I looked at my phone. That is when I saw the following Facebook reply to a news item about our advocacy ride. When Anne came back in I showed her this, and I mentioned that these are the sort of images that the SNP are unintentionally aligning to. Why did you personally vote against the scheme?... This was Anne's answer.. They messed up phase 1, which was the easy bit, and you've got cyclists using the main carriageway. That tells me there is a design fault. Phase 2 has harder junctions and I'm not convinced by what I've seen in phase 1 that phase 2 will be designed right. Why then did you vote against it now, when we have only seen preliminary designs? If you are concerned about the design of phase 2, why not let it go to the detailed design stage where you can actually see the design, and vote on that!? I actually asked Anne this question in two slightly different ways, and both times, she screwed her face up a bit, and shrugged. She didn't have an answer. Can you see why we are frustrated....? I then finished off by saying that I feel the decision was ridiculous, especially considering the benefits that cycling would have on pollution, congestion, health, etc. I also pointed out that the decision had ramifications far beyond East Dunbartonshire and that many from outside the area were watching closely. We stood up, shook hands and I took a slightly bored and tired 11 year old home, unfortunately not really having moved forward very much. I had to do it, I had to understand why a councillor who was actually pro-cycling in the past, had voted against Bears Way. We are now left with a path that starts and goes no-where, a section of a community that is angry enough to suggest placing tacks on a path where families are going to cycle, and a number of councillors who I believe, and this is my personal opinion, voted for the benefit of themselves rather than the area and people they represent. I'm not sure my son will value the word of politicians from now on. I think he is right. It was me being a bit daft. I was imagining a crazy situation where councils were ripping out cycle lanes and people were calling for roads to be widened. I actually wrote this about a year ago. A sort of Armageddon thought experiment. Yes, it would appear that my thought experiment is coming to pass. Cycle lanes are being ripped out and as you will know if you follow this blog, Bears Way is not being extended and who knows, might be ripped out too, as the local SNP don't think segregation is the way forward. Let's just give up then? Not a chance! Oh no. If we give up now, that's the end. But if we fight, and we fight hard, and we continue to challenge the misinformation and , let's face it, downright lies, then we will win in the end. Not sure?! Well, all you need to do is sign a wee petition. It only takes a minute (unless you want to add a comment, which is always welcome!). Despite what some of the locals tell you, you don't have to be local to have a say. What happens with Bears Way will have an effect on future schemes all around the country. You know what? Let's forget it. It's too much hassle, people just don't get it. The car is, and always remain king. Let's just leave it there. No. In fact that isn't enough. Let's get the cycle lanes that have been built and rip them out. Let's return the roads to their former glory. Nice and wide, nice and fast and free of cyclists and pedestrians. We all need to get to where we are going fast. We need to get to work, we need to get to the gym (to ride a stationary bike), we need to visit friends, we need to pop a couple of hundred metres down the road to the local shop to get some milk. We need to take the kids to their sports clubs...we need to take the kids to school. That all has to happen fast. Time is precious, time is short. It does not matter that when we get to where we are going that parking spaces are short, we will just ask the council for more. Congestion is a problem, though it isn't because there are too many cars on the road. Oh no, there just aren't enough roads and the roads that we have don't have enough lanes. Build more roads, and widen the ones we have! All this talk of obesity? Not a problem. With more people driving and more parking spaces outside gyms, we can get to the gym quicker and more often. None of those pesky cyclists holding us up! Parking will be free of course. Driving costs far too much already don't you know! In fact, we need to make sure the price of motoring goes down. We need more oil. Yes! Fracking is the answer. Oh, yes the majority of UK fracking will only produce gas and not usable oil, but fear not, other countries can increase their fracking too! There is plenty of oil in he ground, we just need to innovate and we can draw out more and more. Run out?! Ha! Not in our lifetime. That's someone else's problem....and as for climate change, well, we could do with it being a bit warmer in Scotland. Pollution? Na. Cars are getting cleaner and cleaner all the time. Car manufacturers are honest decent folk who want a cleaner environment too! Anyway, electric cars are coming and there is absolutely no pollution from electric cars whatsoever. Yes, at least half a cars lifetime emissions come from the cars manufacture, and yes, electric cars need to get their electricity from somewhere, and that somewhere is often polluting, but hey, it's another chance for innovation! As you will all be aware now, the Bears Way cycle lane which is a four phase project, is now a one phase project. That is, it will, for the forseable future not be extended. It will remain as it is, a cycle lane that starts pretty much no-where, and ends pretty much no-where. I could accept the fact that it was incomplete, because I knew it was the start of something longer and better, but the council (at least one particular section of the council, decided against it). Why? Well, before we get to that I'll describe my experience attending the council meeting. "The meeting started at 6pm...."
I found the door to the meeting and went in. The meeting was in full flow, although my entrance seemed to raise a few eyebrows. Perhaps that had something to do with the Pedal on Parliament t-shirt I was wearing. Who knows. I found my seat and the meeting continued. I was sat next to about 4 or 5 other members of the public, one of which who appeared to have a booklet with all the meeting reports in it and one that was using a tablet. I got out my phone and started tweeting. "Sorry, but you have to switch that off...."
"Ah, but he's only using it to read the agenda..."
Hmm. anyway the tablet user decided to put it away at this point anyway. 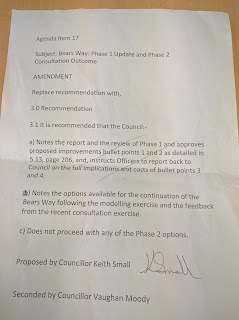 A short while later after a few agenda points were dealt with the next point on the agenda came up, relating to a crossing point to the new Hub building in Bearsden. 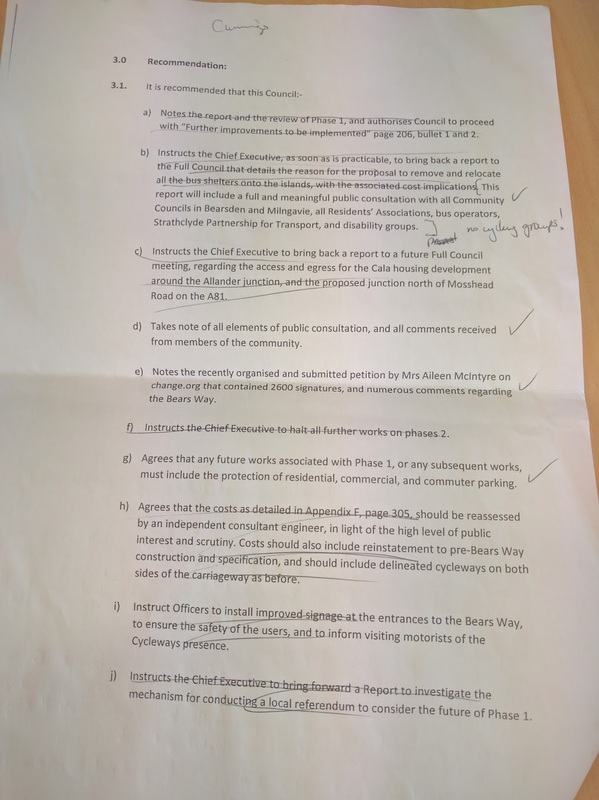 This agenda was led by Cllr Cummings (independent). He wanted a new crossing point, pretty much everyone else (a few exceptions) didn't see the need for it. Cut a long story short, he wanted a crossing that you would have to cross two side roads to use to get anywhere useful, everyone else pointed this out, Cllr Cummings got asked a few questions about it, took offence and got grumpy that everyone was making it personal. They weren't. Cllr Cummings then asked that an amendment be tabled. It was pointed out that it would have made life easier if he had prepared this before the meeting (he hadn't) and it took a while for him to convey the exact wording of the amendment. 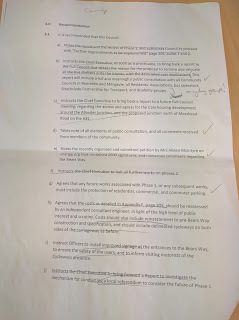 At this point, someone pointed out that the amendment that he was tabling, had already been covered in the report before the council and thus, this was a whole waste of time, Cllr Cummings got even more cross at alleged personal attacks, and everyone got a bit grumpy. In the end he agreed that he would table something at a later meeting. That all took about 45 minutes. During the break I said hello to a few council members who I happened to know. One councillor who I didn't know came over to talk to me. "Why don't you cycle on the canal?" Off to a great start there! I explained my reasons. Turned out that this councillor (who was Cllr Gibbons of SNP) also cycled, had once lived in the area, but was now in Bearsden. He was definitely chatting as if he liked Bears Way and showed me the plans that had been submitted for the Sustrans competition previously (segregated lanes around the Burnbrae Roundabout). I susggested that they were very good, and he appeared to agree....well in hindsight I'm not 100% sure he did...but at the time he was coming across positively. "Depends. See that chap over there (Cllr MacKay), he's not feeling great. It all depends on if he manages to last to the vote or not. If he manages it will go against Bears Way". Anyway the meeting soon started again. This section consisted of technical questions related to the report which had been prepared by the council. This report was comprehensive. In fact there were a few comments on quite how comprehensive it was at 232 pages. I did not have a copy of the report at the meeting. although I do now. You can read it for yourself, here. implementation of Phase 2 of the project. When they 'shockingly' realise that there were two, the paused the meeting, got together for a couple of minutes and then agreed a new mish mash, wording. It was as follows. f) That any future works associated with Phase 1, or any subsequent works, must include the protection of residential, commercial and commuter parking. 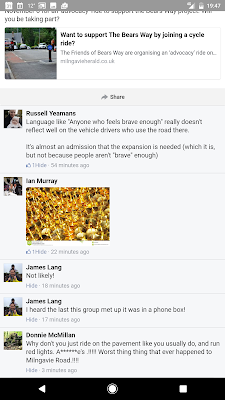 Lots of things were striking about that, but two specifically - cycling groups will not be invited to consult (see (a)). 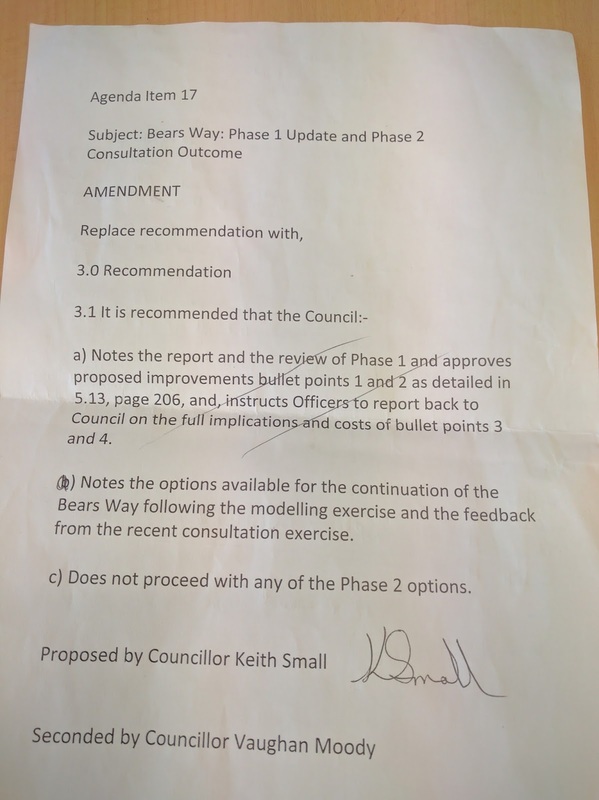 This was pointed out by the labour councillors, but Keith Small (who led the adjusted amendment declined to add them). Secondly the fact that future works on phase 1 must protect parking. Cyclists were not mentioned at all. So Keith Small stood up to support the amendment first. He went on to say that all needed to be considered and stressed that cycling was not the ONLY way of promoting health in the community. He said that segregation had produced conflict. He stressed that the road width had been reduced and that phase 2 would reduce road width. Pure cars, pure parking, pure business. I'm not sure what that was about! He then suggested that rail passenger numbers had recently increased significantly, and made the comment "practical people get the train". He then stressed that the current percentage of people ccling was small (yes 2% up from 0.8% before Bears Way, an incomplete lane...). He was concerned that parking displaced by the lane (which was apparently going to be very small) would result in people driving further, leading to more car use. Yes, that confused me to. He then finished off by saying that 18,000 vehicle journeys a day occur along the road, and that they were frustrated by the 8% that are not using the lane. The Cllr Moody (Lib Dem) stood up. "No one had ever e-mailed him asking for segregated cycle lanes". There is some dispute about at what stage in the process the first person did, as we know people did! He then told us how he used to cycle, but recently has only cycled 10 times. He prefers cycling on wide roads. he also pointed out that we couldn't control cyclists. We couldn't force them to use the cycle path. He then pointed out that just because there is 'free money available' doesn't mean we need to accept it. Yes, he is saying he doesn't want the money. "We've dug a hole, we should stop digging"
Cllr Moir (Lab) stood up. He supports the report, and points out that those now against the scheme were previously in favour. But there had been a big change in April. He wasn't sure why.... The lane was working, and had an added bonus of slowing traffic. Accident rates pre and post lane were exactly the same. Significant health benefits. He then quotes Derek Mackay and Humza Yousaf who were supportive of the scheme. He was amazed at the political turnaround. He hoped those that vote against will be ready for the response after. Cllr Henry (Lab) stood up. By far the best of the night. Well done to the council officers, especially in the face of abuse. The whole tone of the campaign had been horrible. She had spent time in London and though the segregated lanes there were wonderfu;. She was pleased when she heard they would come to East Dunbartonshire. They were giving people a choice, they were for the next generation, visionary, exciting. We needed to be brave and have vision. Cllr Shergill (Lab) stood up. He pointed out that Derek Mackay said the scheme was exemplar, and it had been endorsed by Humza. At this point, everyone in the room was flagging, and no-one else could be bothered to talk, so Cllr Small got back up to sum up. "Segregated lanes are not a good way to encourage cycling"
Milngavie Road was apparently, in his words, 'shared space'. "Motorists and cyclists co-existed happily." Segregation my dear friends (and this is pretty much what he said), was heading down the wrong road (ahem). The way to achieve 10% modal share of cycling was to get people cycling between where they live and schools. Where they live and shops. "Segregation will not get to 10%"
Right! Haud the bus! Just stop what you are doing! Yes you, Amsterdam (and many cities and towns near by), Copenhagan, London, Seville, New York, Oslo, Minneapolis (yes really) Bogata, Stockholm, Malmo, Berlin.......etc etc. Yes you lot. You've got it all wrong. Listen to the SNP, Lib Dems and a couple of independent councillors in east Dunbartonshire. They know best! Rip it out. Build more roads. Cyclists and drivers get on just fine. Honest. Oh and he said the lane was over engineered. It needed to be less intrusive. So I suspect that means, it needs to be out in the sticks (as Cllr Cummings seems to prefer), shared with pedestrians (oh yes that works) or a wee bit of paint on the road. Can't be holding up the car drivers who have been sold a dream of easy driving by the marketing departments of the car companies! She pointed out that you will never please drivers with cycle infrastructure (I don't actually agree with that, as a recent survey suggested that the happiest drivers were in the Netherlands...). She pointed out that improvements had already been made to phase 1, and that not having phase 2 would please no-one. The lane must be extended. Tada! That my friends was the end of that. A short recess was called (to some mutterings and folk wanted to get home), and councillors checked that there would be no voting against local party policy. They came back....It was all a blur by this point....and the vote proceeded. It went quickly, and I couldn't keep up, but there were many voting for the amendment, including Cllr (I'm a friend of cyclists) Gibbons, and Cllr Anne (I was on the board of the local cycling coop) McNair (who incidentally hasn't replied to my e-mail...). Long story short (well, it's already long).... 11 for Bearsway, 12 for amendment that effectively killed it. I noted the slight smirk on Cllr Small's face, and I walked out. And there you have it. 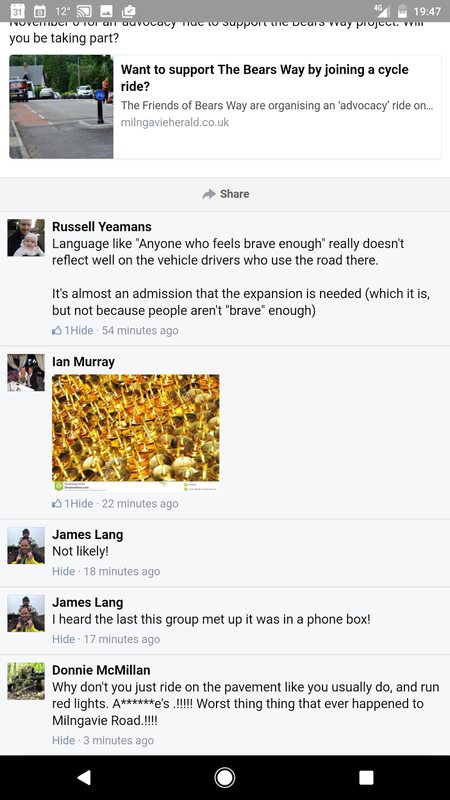 East Dunbartonshire said yes to the driver, and no to anyone wanting to use a bike. There is not allowed to be a vote on this now for another 6 months, by which time we will be in the midst of a council election, which is likely to bring us more SNP councillors. Don't forget folks the SNP and the Liberal Democrats are progressive parties. Yes they are. Well, they aren't where I live.